It adds a new vehicle: a sled. Hey, remember Steep? Wow, did it get frosty in here all of a sudden. Well, Ubisoft hasn't forgotten it, and it's hoping you'll return (or newly parachute into) its extreme-sports-enthusiasts-nobbing-about-on-a-big-mountain game. Which is to say, Ubisoft has announced the Steep Winterfest...er, festival, a DLC pack that doubles down on the game's wackier elements, by having you take on zany challenges to dethrone a series of bosses. Dino costumes, sledges, and goddamn capes await—it does sound kind of fun, in a forced, Crazy Golf sort of way. The Steam reviews suggest that Winterfest is not fun, and overpriced at $11.99/£9.99 (although it comes as part of the season pass). 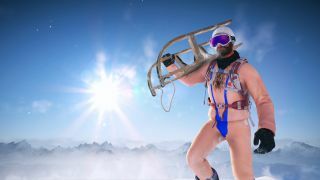 The DLC adds a new sport (and vehicle) in the form of the sled, along with a few new challenges, kerrazy costumes and customisation options, including that elegant banana-hammock outfit up there. Somewhere under all that lies a frustratingly sluggish, but otherwise fairly serene and beautiful mountain traversal game. Here's what Andy thought when he reviewed Steep back in December.